January 19, 2010. That's when iLounge says the Apple tablet will be announced by. And it'll go onsale in May or June, like the iPhone. iLounge has a trove of new rumor about the Apple tablet. Briefly, they say it runs iPhone OS, and that there will be two tablets—one with 3G and one without—with about 7x the touchable surface area as the iPhone, with a resolution that's high enough to read books, magazines and "cropped" newspaper pages. Which is what it's supposedly designed to do: Replace books and magazines, while being a better media player and web browser than the iPhone. 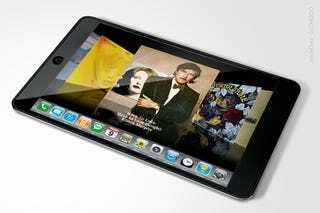 Apple Tablet with 9.6-inch Touchscreen, HSDPA in February?